There was some outstanding performances from our internationals at the weekend, with Alan Browne the main talking point. He netted his 11th Championship goal of the season, and looks like he could be a big player for Ireland in the upcoming Euro 2020 Qualifiers. Should have started Austin instead. Can be an important squad player but not as a striker and certainly not based on his performance against Cardiff. Harry Arter played the full 90 minutes for the visitors, and was given a 7/10 by Wales Online, who mentioned the effectiveness of his relentless pressing. Declan Rice reprised his holding midfield role for West Ham in their trip to Crystal Palace, with Football.London giving him a 6/10. Shane Duffy scored for Brighton, as his side suffered a poor afternoon defensively falling to a 3-1 defeat at home to Burnley. He performed admirably, clearing one off the line as well as hitting the bar with another effort of his own. He received a 6/10 from the Brighton & Hove Independent. Jeff Hendrick continued in right midfield for Burnley, being given a 7/10 by 90mins.com as his side continued their strong recent run of form. Cyrus Christie was a second half substitute for Fulham in their disastrous 3-0 loss to Manchester United, with his side looking increasingly likely to be condemned to Championship football next season. There were a number of Irish players involved in one of the games of the season on Friday night, when Aston Villa scored three goals in the final 10 minutes to draw 3-3 with Sheffield United. Conor Hourihane played the full 90 minutes for Villa, registering an assist for their first goal and getting a 5.5/10 from the Birmingham Mail. John Egan and Enda Stevens started that game for the visitors, with both being rated at 6/10 by The Star. David McGoldrick saw 20 minutes of action from the substitute's bench. Darren Randolph's Middlesbrough conceded a 100th minute equaliser to daw 1-1 at home to Leeds, with the Irish goalkeeper being named man-of-the-match (8/10) by the Teeside Gazette. Shaun Williams started Millwall's 1-0 defeat at Swansea, rated at 6/10 by Football.London, he was substituted in the 74th minute despite his 'tidy passing'. Aiden O'Brien was introduced from the bench late on in that game. Preston's Irish contingent joined a a fruitful afternoon, with Alan Browne scoring this cracker and being rated at 8/10 by the Lancashire Evening Post. 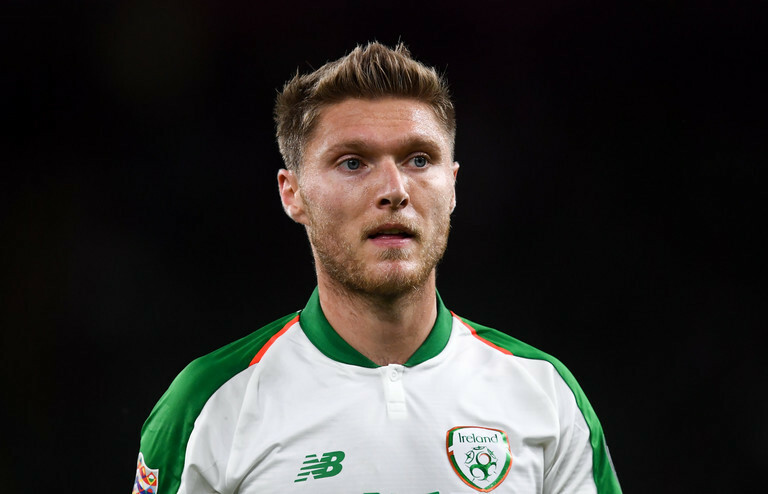 It was Browne's 11th goal of the season, and the 23-year old is looking increasingly likely to be an important player for Ireland in the upcoming Euro 2020 Qualifying campaign. Sean Maguire was given an 8/10, coming up with this lovely assist for Preston's second goal. Richard Keogh was his usual solid self in Derby's 2-0 win at home to Hull, getting a 7.5/10 from the Derby Telegraph. Classy play in the middle from the Irish winger who was the standout man in the first period. Maybe needs to work on his finishing to add the final part to his game. James McClean began Stoke's 1-0 home defeat to West Brom up front, with his performance rated at 5/10 by the Stoke Sentinel. The Irishman was up for this game. He was pumped up from the first minute and was full of energy throughout. The midfielder was an option for his team-mates whenever they had the ball and, while it didn’t always come off and there were some loose touches, he looked to make things happen.